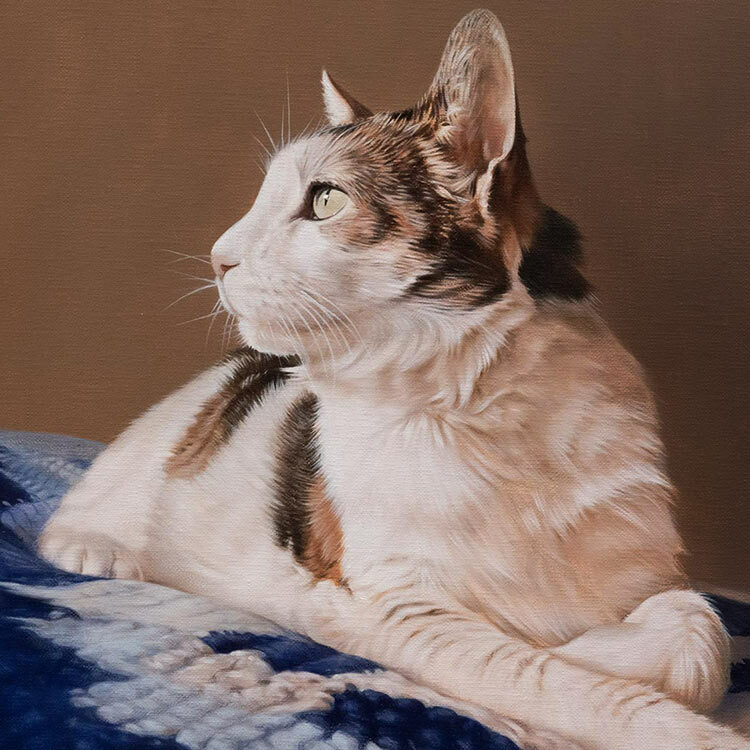 Quite Full body oil paintings are especially popular with our clients, and this portrait of Lockhart was painted with a studio style background at the request of our client. This way the full focus is on the horse and not distracted by any out doors scene or colours behind. Lockhart has everyone’s full attention. A lovely way to represent your horse, especially at the larger sizes as this one was. Read on to find out more about the commission and if you like our page, please feel free to share it using the buttons below. 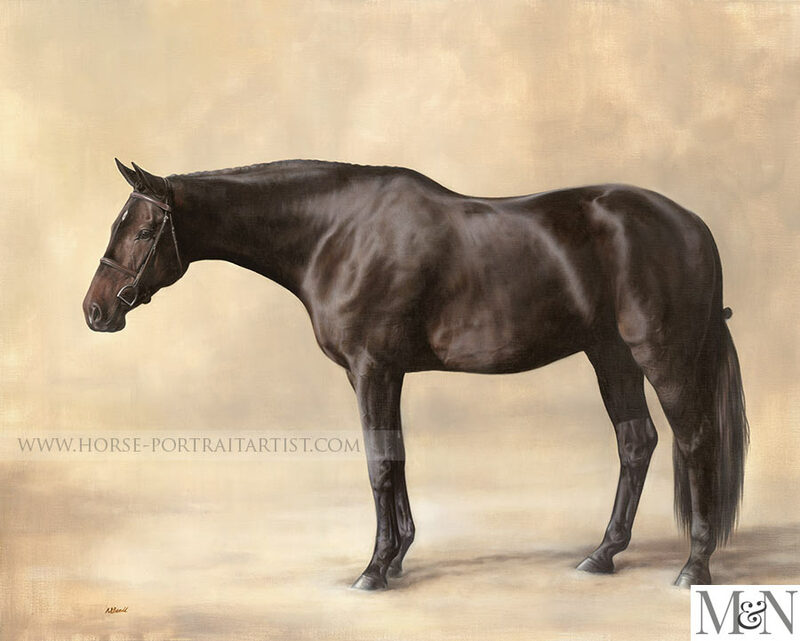 Erin Galasterer, USA, contacted Nicholas in 2012 enquiring about his full body horse portraits as she was looking to get one painted of her stunning horse Lockhart. Erin had specific requirements about the painting, she wanted a large size so opted for a 36 x 28 inches size canvas. She also asked if Nicholas would be able to paint Lockhart in a full body pose with a studio style background. Erin had a good idea of how she wanted the portrait and emailed us a few old paintings of horses to show us what she had in mind. Erin had some professional photos taken which she emailed over for Nicholas to work from, her favourite for the main pose was perfect to work from. It took Erin was thrilled with the portrait, as you can see from the emails below. We took a range of photos of the painting when it was completed along with a photo of Nicholas holding he portrait outside so that viewers to see its true overall colour. We hope you like it! 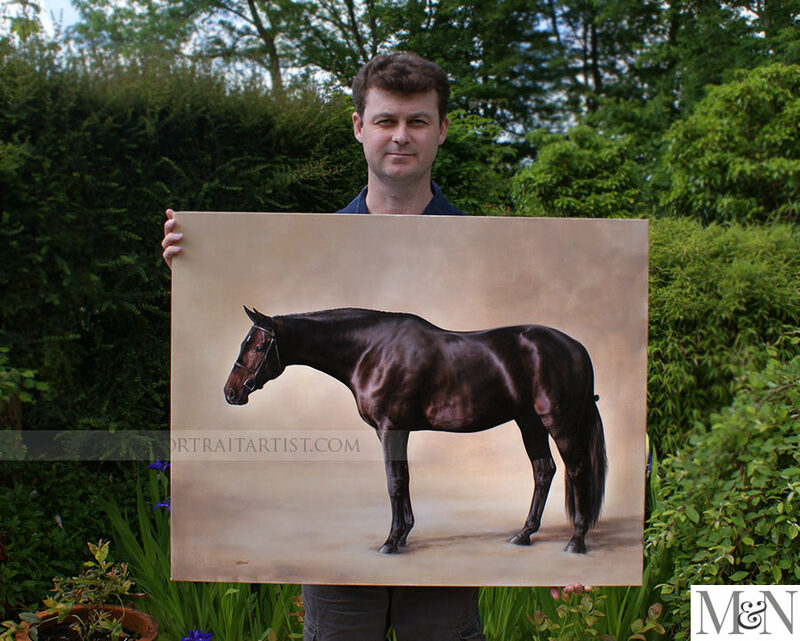 We hope that you have enjoyed reading about Erin and the commissioned oil painting of her horse Lockhart. 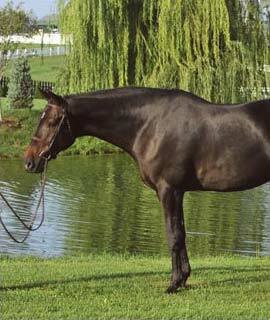 We would love to paint a portrait of your horse similar to this. perhaps you have the perfect photo or would like to chat to us to find out how to take a side on photo and the best way of going about this. Why not contact us on our horse portraits contact page and chat to us about your requirements.